Cable management and electrical distribution for theatrical and studio lighting, front of house lighting, audience chamber lighting, and other architectural/industrial applications. The pantograph cable management system provides an efficient means of maintaining control over power and data wiring for rigging sets. It prevents tangling and cable crimping and provides a clean look to the assembly. They can be mounted to the gridiron or overhead structure. 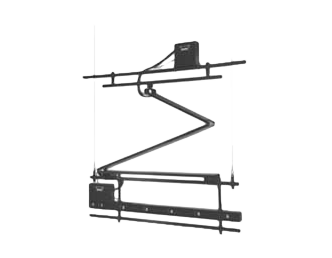 For use with fixed speed motorized rigging hoists up to 20 fpm (0.1 m/s). Black, extruded aluminum cable housing. System utilizes flat multi-cables for various circuit configurations. Attaches to upper rigging pipe batten between lift lines. A horizontal stabilization track is supplied for the upper connection. Extruded aluminum connector strips have interlocking cover sections. Flush receptacles or 18″ (457 mm) pigtail mounted connectors are available. Pre-wired with 125° C XLP high temperature wire to molded barrier terminal blocks. Black extruded aluminum cable housing, custom colors available.